During the early days of Ra Gada, Prince Hubalajad claimed this Hammerfell peninsula for his own. When all his ambitious endeavors ended in failure, the region acquired the nickname Hews' Bane—and it stuck. Hew's Bane, originally known as Khefrem's Boot, is a peninsula in southern Khefrem on the south coast of Hammerfell. The region is named after Prince Hubalajad, or "Prince Hew", who attempted to bring civilization to this corner of Hammerfell in the early days of the Ra Gada. He discovered a barren peninsula hostile to most life; scorching heat and seasonal flooding led to brackish water and ground which was unsuitable for crops. Despite his best efforts, Prince Hew was foiled at every turn, and nearly all his endeavors resulted in failure. 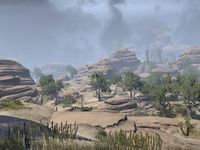 Hew's Bane is a DLC zone added by the Thieves Guild DLC. For Thieves Guild faction quests, please see Thieves Guild Quests. A Secret Shame: Restore the great seal in Bahraha's Gloom. The Shark's Teeth: Show the Wake Walkers who is really in control of Shark's Teeth Grotto. Entering Abah's Landing for the first time will unlock the Thieves Guild skill line. As of Update 10, the service icons in Abah's Landing also appear on the zone map. This page was last modified on 31 August 2018, at 10:25.